Are your embedded design projects hitting roadblocks? Make sure you’re not making these common mistakes. In the embedded system world, beginning a new design project can be exciting. It’s easy to get swept away with the possibility of creating an innovative product that the market has not seen before, and that will exceed the customer’s expectations. But prior to starting work, it’s essential for project leaders to consider all available skill sets within the design team. It’s equally important to have a clear understanding of what specific vendors can offer, in terms of the tools the vendor will be using, and the level of service they can be expected to deliver. Additionally, project leaders need to consider—of course—the customer’s requirements around product specifications and the project deadline. For this reason, it’s essential to capture customer requirements in their entirety prior to starting the project, and to be sure the entire design engineering team is aware of those requirements. Lastly, solid and open inter-team communications, and the ability to coordinate widely varying personalities on the project, are also critical. Simply put, ensuring a design project’s ultimate success requires an understanding of how to bring all of these things together. Overlooking the intersection of all of these elements leads to errors, cost overruns, missed deadlines and a poorly designed product. A delivered product does not equal a successful product. And a completed project is not successful if your team was rushed, stressed and frustrated. 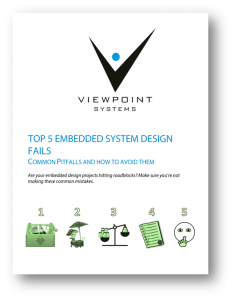 This white paper discusses the top five embedded system design fails and how you can avoid them. It’s not unusual for some team members to have stronger skill sets in some areas than in others. After all, different embedded systems require that your team employ different skills, based on whether the project calls for CAD or FPGA design software, for example, or whether the software language environment will be Microsoft (.Net), Oracle (Java), National Instruments (LabVIEW), or free and open source (Python, Ruby, GCC, etc.). A common design fail is to choose one set of tools over another without considering what is both best for the success of the project and how many of your design engineers are knowledgeable about that particular tool. You should not choose tools based on who speaks first or most loudly in a project meeting, but it’s not unusual for tools to be chosen this way. Do not fall into the temptation of a vendor’s persuasive sales pitch. Many will claim that they are faster, offer the best pricing, etc. If your team is inexperienced in using that vendor’s tools, the project timeline and budget can grow exponentially. On-the-job training can be costly and time-consuming, since your team members may spend more time learning new software or language than they do actually working on the design itself. Conversely, sometimes it does make sense to train team members on a particular tool, as they can use this new knowledge in other projects. Most engineers like to learn new skills—and should. If training is a value-add for the team, plan to budget that as a separate line item, and on a separate schedule, from the project itself. The best approach is to consider all readily available skill sets and tools, and to make decisions based on what will most efficiently and cost-effectively contribute to the project’s success. No two vendors are alike, but another common design fail is choosing one before considering the software they will be using, the inevitable bugs that software will introduce, and how capable your team is of fixing those bugs. Again, will the required fixes add time to the project that the schedule does not allow? Another key vendor consideration is the service experience. Will the vendor be likely to work well with your team, be responsive and meet all necessary milestones? Will the work quality meet the required standards? If you have a smaller company, will the vendor be sympathetic to the limitations of your team’s size, skills and time constraints? To avoid overlooking these key considerations, it’s best to understand the specifics of what the vendor is providing, the pain points or idiosyncrasies of that vendor (because there are always some to overcome), and to choose the vendor that best meets your requirements for both the product and the service experience. Another design fail is overlooking the ability to outsource all or part of a project. Many organizations take the approach of always keeping all projects in-house. The goal, of course, is to maximize profit by controlling overhead costs. But forcing a small, already overworked design team to take on another large project will overburden resources. This not only leads to burnout within your team, it often sacrifices product quality due to unavoidable mistakes. Conversely, in larger organizations, where design engineering costs can run into $100’s per hour, outsourcing all or part of a project can help alleviate budget overruns. For example, as mentioned previously, will the new project require additional training? It can make more sense to enlist a ready expert to take the helm. The most strategic approach is to establish processes for considering available time and skill sets, and to assign projects in-house accordingly, or outsource when your resources or budget require it. Failing to conduct thorough customer interviews at the requirements-gathering phase is another common mistake. For example, it’s not only important to understand requirements around product color or weight, but also to understand specifics and reasons behind those requirements. “The communications bus shall be MIL-STD-1553” is an example of a good requirement. On the other hand, sometimes the requirements are much less clear. “The embedded system will have high up-time.” How high? “The system will not weigh too much.” How much is too much? Is there wiggle room in either requirement? Understanding the reasons behind the product specifications can help avoid disastrous outcomes. The smart approach to requirements-gathering is to involve all team members at the outset of your requirements-gathering phase. This should include the design engineering team, the management team, and the customer. First-hand knowledge is crucial, because vagary in the requirements-gathering phase leads to errors. This is perhaps the most common design fail and the most difficult to avoid. It’s a universal truth that a talent for design does not equal good communication skills. Engineers of every type—including design engineers—are not immune to challenges around communication. But a lack of communication in a project can lead to a design failure in the end product. Overcoming this challenge requires a three-pronged approach. First, it’s critical to make sure that for each project there is a strong manager or project lead in place to assist where needed. This person should be adept at proactively facilitating communication and working with individual team members to improve on areas of weakness. Is a team member unable to communicate effectively via email? Is another team member particularly reserved in a public forum, and unable to speak effectively (or at all) in meetings? Coaching can help. Of course, this always requires a willingness from the team member to hone those communications skills. It can’t be overemphasized that individual team members must take responsibility for communicating effectively as well. The second essential is to have the manager or project lead assist in choosing the right communication format for each person on the project, whether that’s email, in-person meetings, conference calls, etc. (Just because someone is being coached doesn’t mean he or she will ever really excel in all communication areas). Lastly, the importance of open and honest communications between management and engineering resources cannot be understated. This necessitates management’s willingness to consider whether the team is prepared to meet all the customer’s requirements for both specifications and timelines. The engineering team must feel comfortable providing feedback on what they think they can and cannot do within the specified time period—and to suggest outsourcing when necessary—without fear of losing their job. Not all design fails spell disaster for a project. After all, some mistakes are necessary to gain knowledge for future projects. Yet other fails, like those mentioned above, lead to mistakes, cost overruns, damaged morale, unnecessary re-work and a dissatisfied customer. To ensure a project’s success, it’s critical to know the difference between the former and the latter. If you’d like someone to take the industrial embedded development off your plate, you can learn more about how we can help or reach out to start a conversation.